You may want to sit down for this: Thanksgiving is less than a week away! How nuts is that?!? But ready or not, here it comes. Which means not only does your menu need to start rapidly coming together, but so does the wine lineup for the evening. Even if you are not hosting (which makes life that much easier) you can still have a huge impact on the meal and overall holiday enjoyment by bringing the right wines for your family and friends to enjoy. I mean, who doesn’t love the guy who rolls in with a few bottles of really good juice?! Which then begs the question… what are the right wines to pair with a traditional Thanksgiving meal? The great thing about oven roasted turkey and all the trimmins is that there are a ton of wines that will pair well with that type of meal. It just depends on what style of wine you and your crew prefer. The one trick is to avoid any overpowering wines with high tannins. Turkey doesn’t have the fat content of red meat, which typically will bind with those tannins. 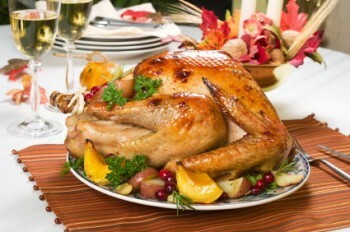 Instead, the tannins can take center stage rendering the turkey and stuffing as bland as opposed to full of flavor. So while just about any wine will work, here are some that may complement your meal better than others. The classic white wine pairing with turkey is Riesling. The low alcohol and high acid can be a refreshing complement to the inherent richness of the meal. I prefer to stick with the drier style (Kabinett) as opposed to those that have a sweeter profile (Spatlese). The 2011 Fox Run Reserve Riesling is a stunning option for under $25, and allows you to drink local! For a real value the Chateau Ste. Michelle Riesling is consistently solid and goes for under $10 at most retailers. If you like your whites a little bigger and bolder then a buttery, oaky Chardonnay or Burgundy may be the way to go. Although be careful of the super oaked options, as even those woody tannins can stifle the richness of the bird. My favorites right now are from Davis Bynum and Byron, but on the value side you can grab the Seaglass Chard from Santa Barbara. It is unoaked, clean and vibrant… a delightfully refreshing option for around $10. If you Google red wine pairings for Thanksgiving Turkey, the most commonly recommended wines are Pinot Noir, Zinfandel and Rhone Blends. Pinot is arguably the best option as the higher acid levels, vibrant fruit and peppery spice really bring out the best in just about any poultry dish. The problem in my family is that no one drinks Pinot. They prefer their wines big and opulent and tend to reach more towards a bomby Napa Cab than an elegant red Burgundy. Although I guarantee that bottle of the 2013 Papapietro RRV Pinot will be in attendance this year for my Turkey Day meal. So the pairing that usually works best for my crew is a hearty Zinfandel from California… and no, not the pink stuff. It tends to have loads of big, dark and spicy fruit but a little lighter body and softer tannins than Cab. Seghesio is always my dad’s go to, but personally I prefer the Terra d’Oro Zin from Amador for a few bucks less. Forward, rich and ripe with a nice balance of medium to high acid and tannins, this one is always a crowd pleaser. And if I’m feeling a little frisky, I will break out one of the Zichichi Zins from my stash. 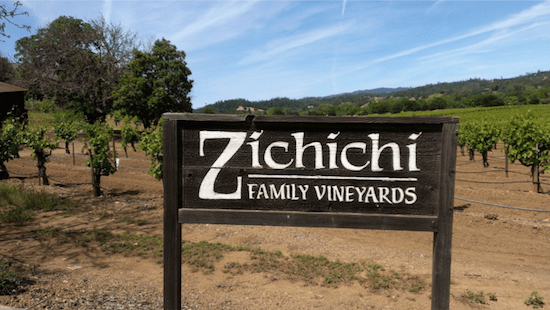 Steve Zichichi is a Zin genius and making some of the best Zin to come out of Dry Creek and all of California really. It ain’t cheap and pretty hard to find, but if you can get your hands on any of his juice I highly recommend it. The classic Rhone blend consists of Grenache, Syrah and Mouvedre with Grenache usually taking center stage. Somewhat like Zin, Grenache leans on the lighter side in terms of body with good acid, spicy berry fruit and plush tannins. Blend in some meaty Syrah and a dollup of dark Mouvedre and you have an ideal blend for your Thanksgiving table. Cotes du Rhone Villages wines offer a step up in quality (usually) over the standard CDRs, and still can be found for less than $20. However they have a hard time standing up to those bigger and more complex Chateauneuf du Pape and Gigondas wines, which is why those are just about impossible to find for under $40. Some value producers include Barville, Santa Duc and Louis Bernard. But if you are from the ‘Go Big or Go Home’ mentality then you can’t go wrong with any of the big dogs such as Domaine de Pegau, Vieux Telegraphe, Chateau de Beaucastel or Chapoutier. Just be sure to give those bigger wines some oxygen before you get start digging into them, or they may come off a little tight and inexpressive.